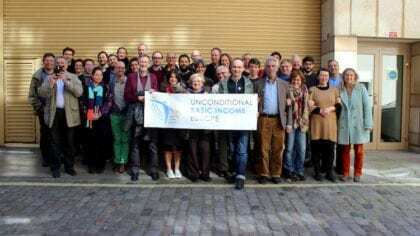 BIEN’s European affiliate, Unconditional Basic Income Europe (UBIE), held its latest annual meeting March 24-26, 2017, in London, UK. UBIE elected a new board at the meeting. UBIE’s annual meeting began on the evening of Friday, March 24, with “Basic Income and the Europe we want”. At this public event, nine representatives from nine different countries — Portugal, Spain, Netherlands, Austria, Germany, the UK, Sweden, and France — shared reports on the current status of the basic income discussion in their respective nations. Events on Saturday, March 25, featured speakers from the British trade unions GMB (which passed a pro-UBI motion in June 2016), Unite (which passed a pro-UBI motion in July 2016), and Unison (which has been “looking into” UBI over the course of the past year). Participants from UBIE described the event as a “very enriching and inspiring discussion for countries struggling to get in touch with their national unions”. Later on Saturday, UBIE members met for workshops on topics such as a new European Citizens’ Initiative (ECI) for basic income and lobbying the EU for basic income pilot studies or a a Eurodividend (a partial basic income paid to all Europeans). Chair: Dániel Fehér. Fehér, who now lives in Berlin, Germany, has been a member of UBIE’s board since 2015, and has assisted with its lobbying and publicity efforts since 2013. He was also active with the campaign for the ECI while living in Brussels. Vice-Chair: Anja Askeland. Askeland served as BIEN’s Secretary from 2014 through 2016, and was a cofounder of BIEN’s Norwegian affiliate, Borgerlønn BIEN Norge, in 2012. Vice-Chair: Lena Stark. Stark has been a member of UBIE’s board since 2015. She has also recently started a basic income political party in Sweden. Secretary: Aurélie Hampel. Hampel is the international Coordinator of the French Movement for Basic Income. She is also active in campaigns for an “EU agrarian UBI” in France. Treasurer: Ulrich Schachtschneider. Schachtschneider is active in German basic income movement and an activist and writer, having published considerably on an ecological approach to basic income. Barb Jacobson stepped down from the board at the meeting, after having served as its Chair since the formation of UBIE in February 2014. She commented, “It’s great to see some fresh faces, and it is time for me to concentrate on some specific UBIE and Basic Income UK projects. It has been a real honour. I’m looking forward to working with the new board and wish them all the best.” Former Secretary Nicole Teke also stepped down, following two years of service. Further updates from the new board will be shared in the UBIE newsletter. Information and photos from Aurélie Hampel. Post reviewed by Dave Clegg.